WoodBlocX are light and easy to build with. They need no power tools or technical knowledge to assemble. We will send you a fully bespoke set of instructions for your build. The WoodBlocX team are here to help and have a wealth of experience helping clients achieve even the most complicated of planters. WoodBlocX award winning raised beds, as seen on the BBC Dragons' Den, gives you the ability to choose any shape or size raised bed designed exclusively to suit your garden. 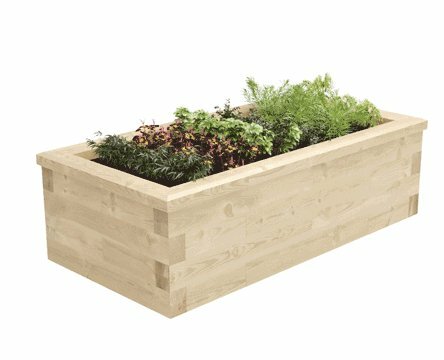 WoodBlocX is a unique, patented, product creating almost any structure you would want in a garden: raised beds, planters, retaining walls, ponds, edging, seats and more. It is easy to use, attractive, strong and durable. The individual BlocX, made from sustainably-sourced wood, are light and easy to handle, and fit together using dowels made from recycled plastic. Creating a WoodBlocX structure therefore requires no power tools or specialist skills. The finished structure needs no foundations, yet is solid and strong, and will not distort, bend or collapse for at least 15 years when installed following our guidelines. WoodBlocX supplies kits to build raised beds, planters, ponds and much more in a variety of shapes and sizes, or you can design your own using our handy online calculators. Use our simple online calculators to design your own made to measure kits! We offer an online raised bed calculator, wall calculator and pond calculator, so you really can create any design you wish! Don't forget we also offer a totally free bespoke design service with no obligation to buy. There is also a wall calculator to work out what you would need for a retaining wall or terraces, or again, just send us a sketch or call us. The bespoke design service is free, and there is no obligation to buy. Once you’ve finalised your order, it will be with you 3-4 working days, with full specific instructions on how put it together. For more information, use the menu above to navigate to specific products. To learn more about the WoodBlocX products, see Why Choose, FAQ or contact us.